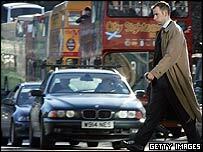 BBC NEWS | UK | Scotland | Congestion: to charge or not to charge? It's difficult to see which will be the next British city to introduce a congestion charge. Doubly so given Edinburgh's rejection of the concept. Many cities have tentatively considered the idea. It's a tempting concept on paper. Money is raised for local transport services and, if London's anything to go by, congestion noticeably reduces. Ken Livingstone was re-elected as London mayor, so making drivers pay certainly isn't political suicide. But as it stands there are no firm plans for a charging scheme anywhere else, although Cardiff is thinking about it. Manchester's been told by the government to consider a charge to pay for the extension of the city's tram service. Arguably a congestion charge scheme can be introduced only if the city itself is right for congestion charging and if the charging scheme is right for the city in question. One of the biggest issues is the effect a scheme will have on the city's economy. In London there have been repeated warnings that trade is being damaged by the weekday charge of £5 for entering the city centre. Smaller towns don't find it as easy as London to attract shoppers and new employers. They worry that if a charge is introduced, business will simply shift to a rival town. It can also be difficult to design a system of charges that is fair and enforceable. The architects of the London scheme had been thinking about the best way to do it for literally decades. 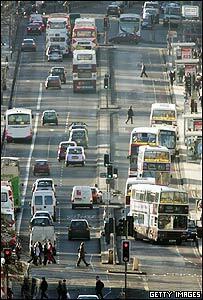 Many advocates of charging believe the Edinburgh system was simply too complex. According to Stephen Joseph, director of the campaign group Transport 2000: "In Edinburgh the council created something of a rod for its back by trying to introduce a somewhat complicated scheme involving a double cordon. "A simple 'in or out' scheme as in London might have been easier to gain support for." The other problem for congestion charges involves one of the transport world's favourite metaphors - the carrot and the stick. Most experts believe drivers are far more willing to pay if they can see the carrot of better public transport dangling in front of them BEFORE they're hit with the stick of a congestion charge. The problem is that the vast sums of money needed to pay for improved buses and trains can often only be raised by introducing a charge. London had the advantage that most of its commuters already used public transport. Proportionately only a small number of drivers would need to give up their driving habit for traffic levels to fall and the jams ease. To accommodate them, Ken Livingstone quickly poured money into better bus services, but had to accept it was going to take a lot longer to improve the London Underground. But it has worked. Traffic levels are down 15% and there's now only muffled opposition to the charge. As a result it's probably London again that will push forward with congestion charging. Mr Livingstone wants to extend the scheme out to the west of the capital. But it won't happen before the end of 2006. London's also trialling a system of electronic beacons to make it easier to enforce the charge. And in the far distant future, the government is peering at the possibility of a nationwide system of road charging, perhaps using satellite tracking systems - a move that could change the way we use our cars forever.